SCOTTSDALE, AZ -- (Marketwire) -- 03/26/13 -- TASER (NASDAQ: TASR) today announced multiple orders of its TASER Conducted Electrical Weapons (CEWs). These orders were received in the first quarter and are expected to ship in the first quarter. "TASER International continues to see growing interest in the new Smart Weapon platform with significant new X26P deployments with the New York State Police and New Orleans Police Department," said Rick Smith, CEO and founder of TASER. "We continue to see building momentum as agencies upgrade to our TASER X2 and X26P Smart Weapon Platforms for enhanced performance, ruggedness, safety and analytics." TASER protects life. TASER Conducted Electrical Weapons (CEWs) have saved more than 100,000 lives from potential death or serious injury. We enable greater transparency with the industry-leading TASER CAM and AXON Flex on-officer video systems. Together with our customers, we are defining the future of smart policing by connecting intelligent devices and sensors with the first secure cloud-based digital evidence management solution for law enforcement: EVIDENCE.com. Since 1994, more than 26,000 private individuals have relied on TASER technology to protect themselves and their loved ones. 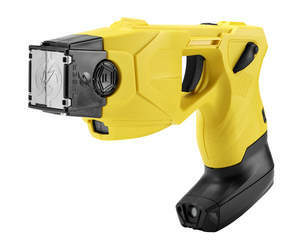 Learn more about TASER and its solutions at www.TASER.com and www.EVIDENCE.com or by calling (800) 978-2737. TASER® is a registered trademark of TASER International, Inc., registered in the U.S. All rights reserved. TASER logo, TASER X26, TASER X2, TASER CAM HD, Trilogy Logs, and AXON Flex are trademarks of TASER International, Inc.
For investor relations information please contact Erin Curtis by phone at 480-515-6330 or via email at [email protected]. Copyright © 2013 Ulitzer, Inc. — All Rights Reserved. Cheap Laptop or Expensive Smartphone – Which Is Right for You? An ongoing conversation to increase revenues through using benchmarks around best practices, establishing a plan of execution and using automation. This could include topics such as benchmarking, process, social media, planning, execution, technology and metrics. My background is in software platforms, IT services, marketing, sales and the Internet. AJAX, Flash, Silverlight, or JavaFX: Must We Choose?